After visiting the points of interest of Cartagena, I travel from Cartagena to Aruba by boat. If you’ve been to Bogota or Medellin and enjoyed the eternal spring climates then you’ll encounter a big change arriving in Cartagena. 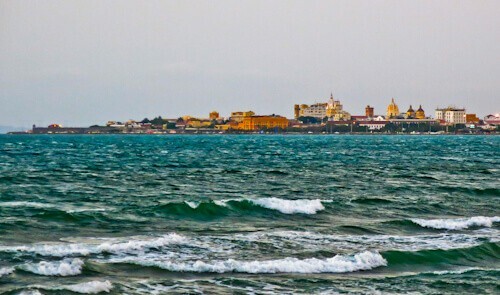 Cartagena is the coast, Cartagena is the Caribbean! It gets very hot here during the day and has a very tropical feel, even more so with how the locals dress and look. 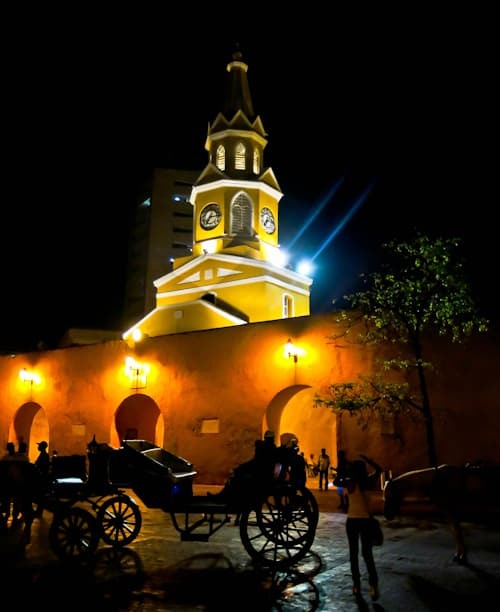 The people of Cartagena are called Costeños by those of other parts of Colombia. How good is your Spanish? Good luck understanding the Costeño accent! Historic Center – The most expensive part to stay, but right inside the walled center. Getsamani – This is where backpackers stay, a short walk from the city walls. Bocagrande – There are some famous hotel chains here and a beach but it’s a short bus or taxi ride away. It’s possible to walk around the historic center on the ancient walls. During this walk, you’ll enjoy great views of the historic center, Bocagrande, the castle and the Caribbean sea. The famous place to go to watch the beautiful sunset over the Caribbean sea is Cafe Del Mar which is located on city walls. Outside the restaurant here are street vendors walking around selling cold beers (you need to haggle the price) if you don’t wish to go in the restaurant to watch the sunset. You should definitely pay a visit to the San Felipe de Barajas castle, just not in the middle of the day when it’s incredibly hot. As well as a castle it’s a super fort, the most significant fort built in the new world by the Spanish. Its quite a walk to get to the top but worth it for the panoramic views of the city and of course the castle. It is probably best to take a taxi to the Castle but you can also walk to it. If you do decide to walk to the castle I’d recommend passing the India Catalina monument and los zapatos viejos on the way. 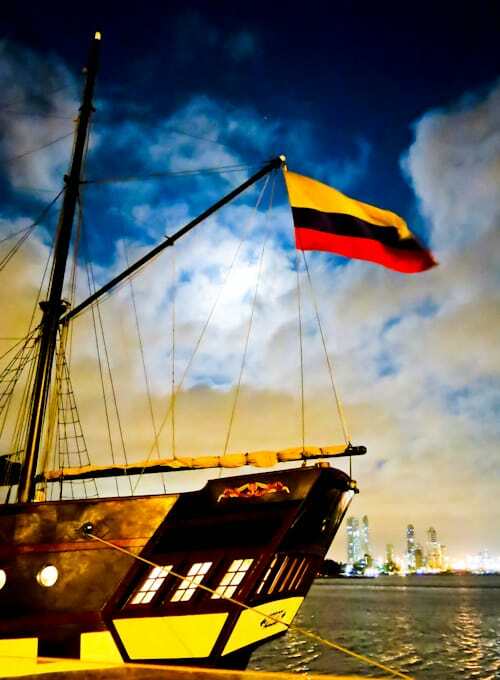 There is a pirate ship in Cartagena called Galeon Bucanero. As Cartagena is a city famous for pirates it’s worth a quick look at the ship. For photographers a pirate ship makes for great photography. Not far from the Galeon Bucanero you’ll find the port for boats to the Rosario Islands. I would recommend arriving at the port before 9am to find a boat. You could even go the day before and see what can be organised for the next day. Another method of visiting the islands would be to take a tour or catch the bus. The next stage of my trip was originally to go from Colombia to Panama over the land route, crossing the infamous Darien Gap. I had read that this route was potentially quite dangerous and had been been thinking of getting a sailboat as a safer alternative. In many of the hostels of Getsemani, there are advertisements for these sailboat services. They vary from 3-6 night trips to Colón, Panama often passing through and stopping in the picture perfect islands of San Blas. I then decided to go from Cartagena to Aruba by cruise ship. I decided that because I had such a good time on my Celebrity Cruise to Antarctica, I should check for a cruise to Panama. 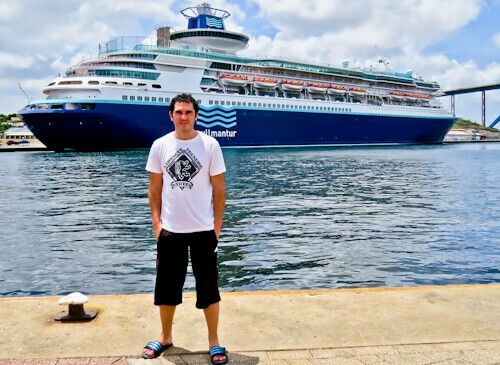 I was lucky enough to find the Spanish speaking Pullmantur cruise which had an itinerary of Cartagena to Aruba as well as Curaçao, Caracas and Panama City. The price is not much different to the sailboats and the cruise is all inclusive (including alcoholic drinks). Although I’d miss visiting the San Blas islands, I’d visit Aruba and Curaçao as well as Caracas, Venezuela. Looks like my kind of Adventure! I can’t wait until I have enough money to explore Colombia! The itinerary you found that covers Cartagena, Aruba, Curaçao, Caracas and Panama City sounds incredible! That sounds like a fantastic trip! Are you travelling alone? How are things with safety in there? I have always wanted to got to South America and to the Carribeans, but have always been too scared of being kidnapped or worse ha. Love all your suggestions and how great is that you got to go on an all inclusive cruise for the same price as a sailboat would have been! Have fun on your travels and can’t wait to read more! Yes, I nearly always travel alone. South America is a lot safer than people think with the exception of Venezuela. If you traveled alone here you will meet lots of new friends! Having said that, you can’t walk around alone on quiet streets. Cartegena and Aruba have both been so high up on my list of places to visit! I never even thought about combining them into a trip together. 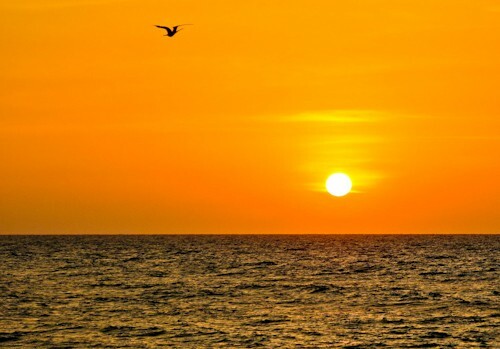 Your photos and your trip both sound amazing and I cannot wait to watch the sun rise over the Caribbean someday too! Cartagena sounds amazing! I just had roommates in an Airbnb that were from Columbia and they said Cartagena was their favorite city! I’ve seen so many blog posts about the boat trip from there to Panama but I love how you took a different route and took the cruise. I would love to do this someday so I will have to keep this option in mind! The colonial architecture and natural beauty has got me curious. I love visiting historic towns like this – you can experience so much about the remnants of the historical past just by walking around in the town center. I would love to have the pleasure of visiting this beautiful city, and country! Thanks for the info on this historical city, I love cities you can get around on foot, will put this on the list to visit – cruise sounds good advice. Cartagena is one of my favourite cities in all of South America! Like you I originally planned to take the route across to Panama via San Blas but lack of funds by that point meant I instead had to fly straight up to Mexico (it cost about $96 which was a bargain!). Sounds like your cruise is a much better compromise though! I am a big cruise fan and have often seen pullmantur cruiseships in dock and wondered what they are like. were there many English speakers on board would you recommend? I would describe this particular cruise as a poorer version of a Celebrity or Princess cruise. On the other hand with everybody on the all inclusive drinks it made for a lively cruise! All the staff spoke English. Most of the passengers were Colombians, Venezuelans and Panamanians who only spoke Spanish so talking with these is a good opportunity to improve your Spanish! I have never been to Cartagena. In fact it wasn’t even in my consideration set. You post had piqued my interest in the place. I would love to visit it someday. And like you said, I wouldn’t visit San Felipe de Barajas castle during the day. Thanks for the tip and wonderful post.